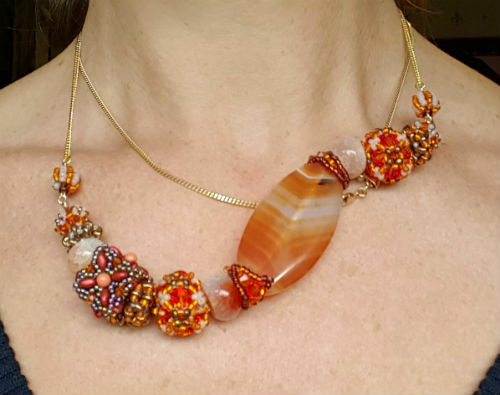 I recently decided to make an Amber necklace in response to a request from the Beadworkers Guild to make a display for next year’s shows. When I first heard about this challenge it is fair to say that I wasn’t immediately inspired. I looked again and realized that ‘amber’ could mean ‘orange’ that I can do! My bead-box rummage turned up a nice selection of orange and amber beads, I especially liked the large agate ovals. The next thing to consider was the agate oval, it measures 5x 2.5cm, which is really quite large! These can be hard to make sit flat in a conventional curved necklace. My idea was to make it more interesting (and sit flat) by suspending it diagonally in the necklace, making the necklace asymmetric (another problem!). 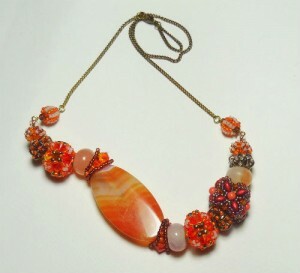 For it to sit diagonally, it needed a wedge shaped beaded bead at either end, to create the curve. 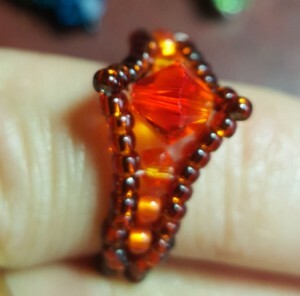 I made these, and found that the design looked just like a Big Diamond Ring that was handy! To create a fixed curve I made a wire armature from 0.8mm craft wire. 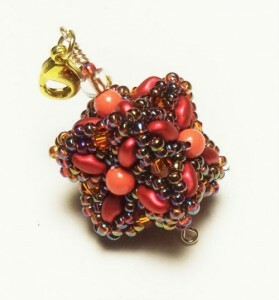 After I had created all of the beaded beads, I arranged them on the wire, and gently bent it into a pleasing wave. Then I carefully removed the beads, and hammered the wire to set the curve. When I finished, I remembered that it reminded me of the moment in October, when I was standing at the beadworker’s guild stall, with this year’s display of beaded beads on it, in a long string. At that moment they were inadvertently nudged so that they slowly fell off the table, one by one, in a wave. This necklace reminds me of exactly that moment! So now it has a name – “Tumbling Beads”! I am already thinking of the next one, I have some lovely blue agate ovals, just the same size….